Along with the announcement of the rebrand, Harvard Business School released the results of a recent survey of nearly 1,000 past participants of the online courses, who reported positive outcomes resulting from the online certificate programs. Over 90 percent of survey respondents said that obtaining the online certificate led to personal betterment, improved their professional life, bolstered their resume, and 90 percent said that it made them a more confident leader and increased their knowledge of business terminology. Similarly, Northeastern University’s Center for the Future of Higher Education and Talent Strategy released survey results from 750 HR leaders, with the majority (61 percent) saying that they believe online credentials are “of generally equal quality” to those completed in-person, an increased percentage from previous years. This online method of offering business education complements a position that Bodo Schlegelmilch, chair of AMBA and a professor of international management and marketing at the Vienna University of Economics and Business, takes regarding the key nature of continuing education for MBA graduates in a Financial Times article published last week. The professor contends that MBAs have a need to continually top-off their degrees to stay relevant in the ever-evolving business environment. He advocates for the MBA as a “rented qualification” dependent upon graduates taking courses to renew their qualification over time. While this is a more radical idea, other business schools are also making changes to support graduates. Over two years ago all University of Michigan Ross Business School alumni, including MBA graduates, were granted complimentary access to all online course offerings and the ability to audit classes on campus. To encourage participation, the school created targeted online courses for MBA graduates returning to the workplace. Though a relatively low percentage of alumni are currently taking advantage of the offering, the most engaged are those graduates with under 15 years of work experience. The rise in the quantity and status of online courses can greatly benefit both prospective MBA candidates and graduates. A prospective MBA student may take an online course or certificate program to help overcome a perceived weakness in his/her application to business school, or to demonstrate commitment to a particular focus area. Prospective students may also want to consider future access to online or in-person offerings for alumni during the school selection process. For MBA graduates, continued online coursework exhibits a commitment to continual learning and improvement. These courses are being taken more seriously by corporate recruiters and the business schools themselves, so prospective and former MBA students should use them to their advantage. The QS Global MBA 2019 Rankings were released this week and Stanford University’s Graduate School of Business ranked first. This is the second year that QS has released global rankings, which include over 250 MBA programs internationally. The ranking’s algorithm incorporates scores for Entrepreneurship & Alumni Outcomes, Return on Investment, Thought Leadership, Employability, and Diversity. In both 2018 and 2019, 13 of the top 25 programs were based in the US. Also in 2019, four of the top five were based in the US, up from two in 2018. Schools in the US scored particularly well in the areas of Employability and Thought Leadership, while international programs fared better in Diversity and Return on Investment. There was one new entrant to the top 25, CEIBS, which is based in Shanghai China. As with all rankings, a closer look at the underlying components, which make up the Overall Score, can provide beneficial information for prospective MBA students. Below are charts showing the top ten ranked schools and their scores for each indicator. The Entrepreneurship & Alumni Outcomes indicator makes up 15 percent of the overall score. 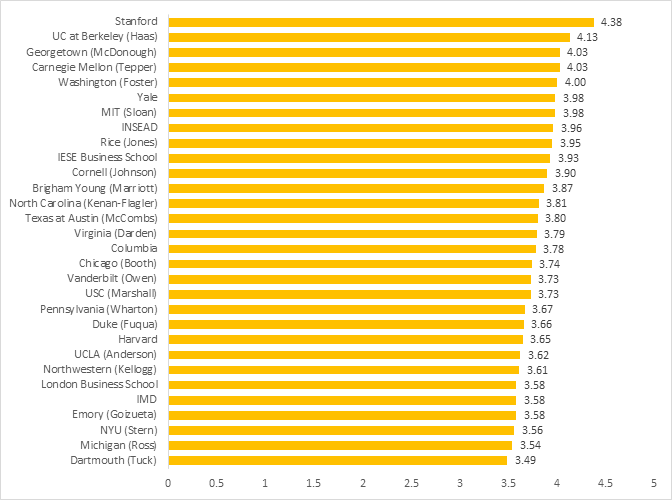 Stanford not only received a perfect score within this indicator but was also about eight percentage points higher than any other program. Harvard, Penn (Wharton), and Michigan (Ross) were also included among the top ten. This indicator should be of particular interest to those keen on pursuing entrepreneurial options post-MBA. The Return on Investment indicator accounts for 20 percent of the overall score. Programs in the US did not fare as well in this category, though Carnegie Mellon (Tepper) and Michigan (Ross) are included within the top ten. International programs with shorter durations saw the highest scores, as shorter programs save students money, both in terms of tuition, as well as lost wages. 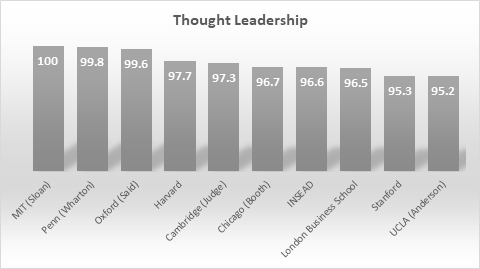 The Thought Leadership indicator makes up 15 percent of the overall score. 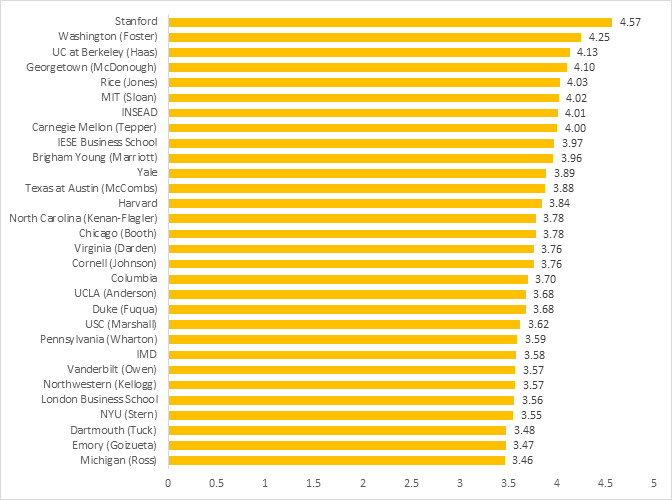 US schools scored well in this category with MIT (Sloan) receiving a perfect score, followed closely by Penn (Wharton). The Employability indicator was given the heaviest weight, and accounts for 40 percent of the overall score. The top five programs, four of which are US schools, all received scores of 99 or higher. The Diversity indicator, which includes Class and Faculty diversity, accounts for ten percent of the overall score. For the second year in a row, no schools from the US were in the top ten in this category. And this is not expected to change significantly in the coming years as international applications to US programs continue to decrease. The Financial Times reported this week that four of the most prestigious business schools in the US saw a drop in MBA application volume for 2018 matriculation. Harvard, NYU Stern, Duke Fuqua, and Berkeley Haas each reported a decrease in applications from 2017 that ranged from 4 percent to 7.5 percent. According to Graduate Management Admission Council (GMAC) data, in the US full-time two-year MBA programs’ application volumes have been in decline since 2014. However, this is not consistent across programs. In 2017, those with larger classes (201 or more students) accounted for 6 percent of MBA programs, but 55 percent of applications and 32 percent of enrollments. Larger schools were more likely to report application volume increases in 2017, while smaller were more likely to have experienced decreases. This decrease now appears to have expanded to the large, prestigious MBA programs. While the decline in applications has not yet affected Harvard’s 11 percent acceptance rate or median GMAT score of 730, it was fairly significant at 4.5 percent. Similarly, NYU Stern reported a nearly 4 percent drop, while Duke Fuqua and Berkeley Haas were at about 6 percent and 7.5 percent respectively. Decreasing numbers of international applicants to US schools, due to a less welcoming political climate, as well as increasingly rigid immigration requirements. Increasingly competitive European and Asian MBAs, offered in English, for those wanting a global experience. Some of these well-ranked programs also offer expedited timelines. Increasing tuition and a robust economic climate in the US, which increases the cost of an MBA in both direct costs and wages-lost. Increasing interest in part-time, online, and/or one-year MBA programs. If you have dual-citizenship, don’t forget to note this on your application. It could be advantageous for you in the admissions process. Be sure to highlight your international experiences and interests in your application. Admissions officers want to create a diverse student body and, with fewer international applicants, these experiences are likely to stand out more. Consider that in strong economic climates, with low unemployment, schools are likely to receive fewer applicants. While this may not significantly change acceptance rates at all of the most prestigious programs, it can provide some benefit with regard to both admissions likelihood, as well as the possibility for substantial merit-based scholarships. Choose your MBA program carefully, rather than automatically selecting a full-time, two-year program. Learn from these trends, by thinking carefully about the type of MBA that will benefit you most. International programs, one-year or expedited programs, and part-time cohort-based programs can all be worthwhile for you and your career. What are Corporate Recruiters Really Looking for in the 2018 MBA Graduate? The Graduate Management Admission Council (GMAC) recently released its 2018 Corporate Recruiters Survey results, providing insight into current employer hiring demand for MBA graduates. In 2018, nearly three-fourths of corporate recruiters globally project to hire MBA graduates to fill business development roles. Functions also in high demand world-wide are data analytics (71 percent), marketing (70 percent), and finance (69 percent). The chart below shows the job function recruitment projections for recent MBA hires, globally and in the U.S.
As one would expect, the job functions MBA hires are placed into vary by both region and industry. Below, are a few key industries with the job functions companies plan to fill with MBA hires in 2018. Globally, recruiters are more likely to hire MBAs into specialist, rather than generalist roles (52 percent and 48 percent, respectively) and into strategic over operational positions (also 52 percent and 48 percent, respectively). In the U.S., recruiters are equally likely to hire MBA students to fill specialist and generalist jobs and just slightly more likely to place an MBA into a strategic role over an operational one (51 percent and 49 percent, respectively). Delving more deeply into the specific skill-sets recruiters are looking for when hiring MBAs, a Financial Times survey published in late 2017 asked 48 leading employers what skills they want in MBA graduates, and what skills they have a hard time finding. The most important skills named by these employers included both soft-skills and strategy. Three of the most important skills, however, were also listed among the least difficult to recruit for: networking, solving complex problems, and working with a wide variety of people. The least important skills were function-specific. And the most difficult to recruit for skills were not listed among the most important, but included a cross-section of disciplines. Both the GMAC and Financial Times surveys provide telling information on how recruiters classify and evaluate MBA candidates. Begin to think like a recruiter. It will be immensely helpful to you as you embark on your management studies. Having clear insight into your desired role will help you to find companies and jobs that offer the best fit for your goals. Additionally, knowing precisely what you want in your post-MBA role will help you to develop your elevator pitch and articulate your career vision clearly as you network and interview. 2. Staying abreast of recruiting trends by function, as well as highly coveted and/or difficult to recruit for skills can provide insight on areas where additional experience can help you to differentiate yourself. For example, data analytics is not only a function where hiring is very active for MBA recruiters, but also a skill that has been named as difficult to recruit for. Gaining some experience in this area may help to set you apart in interviews, even if this is not the primary function for which you want to be hired. 3. Consider how you are highlighting not only the most important skills, but also those that are named as difficult to recruit for in your resume, elevator pitch, and interview responses. While your resume should list your specialized skills, this data suggests that highlighting soft and strategic thinking skills may better serve you in those precious networking and interview minutes with potential employers. 4. Finally, think through your differentiating factors and experiences. Recognize that some skills are easier to recruit for than others, and make sure that you’re aware of and highlighting experiences, coursework, and skills that make you unique among the general MBA population. The 2018 AIGAC (Association of International Graduate Admissions Consultants) MBA Applicant Survey emphasized the “great expectations” last year’s applicants had during the admissions process. The survey data includes 1,979 interviews with 1,377 respondents who applied to at least one school. Data was collected during the Spring of 2018. Like the 2017 responses, this wave of applicants relied heavily on online and technology-based resources to learn about MBA programs, but mentioned the importance of combining these resources with a personalized experience with school representatives. Students used both school supplied resources, as well as information from independent sources. Over 80 percent of last year’s applicants used school websites for gathering program information. And over 50 percent relied on online information sessions hosted by schools and interactions with current students. When asked about the most valuable school specific resource, the most common response was school website, followed by current student referrals, and on-campus information sessions. While most applicants, 86 percent, used MBA rankings for school research, responses on the value of the rankings were mixed. Twenty-two percent of respondents selected MBA rankings as the most valuable independent resource, yet it was also the most commonly selected response for least valuable resource at 24 percent. Respondents named online communities/forums as the most valuable independent resource (24 percent), though only 59 percent of survey respondents used this resource in their research. The majority reported an expectation schools would proactively get to know them through various initiatives, including formal visit programs, diversity and women’s events, and interviews. Respondents spoke to the importance of these face-to-face interactions, noting instances where a positive or negative encounter changed their personal ranking of the program. Furthermore, when it came to finalizing their school lists, over 60 percent of prospective students named reputation (66 percent) and ranking (61 percent) as top factors to consider, followed by school culture (53 percent). Others, however, named geographic proximity to their desired work as the predominant concern as networking is critical, particularly in finding employment with small firms and start-ups. The survey emphasized the critical and personal nature of the school selection and application process. While school and independent online resources can provide comprehensive and useful information, nothing can replace interpersonal interactions. Ideally, applicants will be able to visit the schools they are most interested in, but if not, they should look for opportunities to attend school-hosted events in the city where they live. An analysis published in Forbes by John Byrne earlier this year, which examined the average working hours for MBA graduates in various industries, supported the theory that MBAs are increasingly drawn to companies that offer better work-life balance. He found that, while overall, the median work week for MBA graduates is 54 hours per week, financial firms made up six of the top ten companies with the longest working hours. MBA graduates working at Goldman Sachs averaged 86 hours per week, followed by Barclays (73 hours), J.P. Morgan (72), Morgan Stanley (70), Credit Suisse (70), and Fidelity Investments (68). Consulting firms round out the top ten, with average hours worked ranging from number three, McKinsey & Co. with an average of 72, to A.T. Kearney and Boston Consulting Group with averages of 63. Bryne goes on to highlight that the MBA jobs with the lowest average working hours are at technology firms and large corporations. “MBAs who work for Microsoft average just 44 hours a week, while those who toil for Apple put in 52-hour weeks, a couple of hours below the median. Facebook MBAs average just an hour a week more at 53 hours, while Amazon MBAs hit the 54-hour a week median working for the e-commerce giant.” Those working for IBM, PepsiCo, and 3M company worked just under 45 hours per week. Byrne then calculated hourly wages for various sub-industries and his analysis revealed that hedge fund and mutual fund employees earn the highest hourly rate at $129.46/hour. The average MBA makes about $75/hour. As an industry, high-tech placed third and fifth for e-commerce and software respectively, validating the supposition that technology companies may appeal to MBA graduates who value work-life balance, in addition to high pay and interesting work. Some corporations need to do a better job addressing quality of life concerns if they want to recruit top MBA talent. And current MBAs considering various industries, corporations, or even offers should compare compensation alongside workload expectations in order to achieve both their career and lifestyle goals. Demand is high for recent MBA graduates. In 2017 in the U.S. and Canada, technology firms increased year-over-year MBA hiring by 22 percent and consulting and financial services firms increased hiring by 7 percent and 4 percent respectively. The same report (QS Top MBA Jobs & Salary Trends Report 2018) projects that overall MBA recruiting in the U.S. and Canada will continue to demonstrate robust growth in 2018 (7 percent) and marginal growth in 2019 (2 percent). Technology: The growth in technology firms’ MBA hiring corresponds with reports that Amazon is hiring about 1,000 MBA graduates per year, almost double that of the next largest MBA employer, consulting firm McKinsey[i]. And the growth isn’t expected to slow in 2018. The QS Top MBA Salary Trends Report projects that recruiting in the U.S. and Canada by technology firms will continue growing in 2018 (15 percent) with more marginal growth predicted for 2019 (two percent). In addition to Amazon, Microsoft and Google also recruit consistently within MBA programs, but with lower overall hiring. It is worthy of note that, among the Top 10 programs (US News and World Report), the largest percentage of 2017 graduates who accepted positions in the technology industry came from Berkeley Haas. Consulting: Consulting firms recruit a large percentage of MBA graduates (approximately a quarter to a third of each class at Top 10 MBA Programs) and this is expected to continue. The QS Top MBA Salary Trends Report projects that recruiting in the U.S. and Canada by consulting firms will increase by 15 percent in 2018 with a slight dip to 7 percent in 2019. 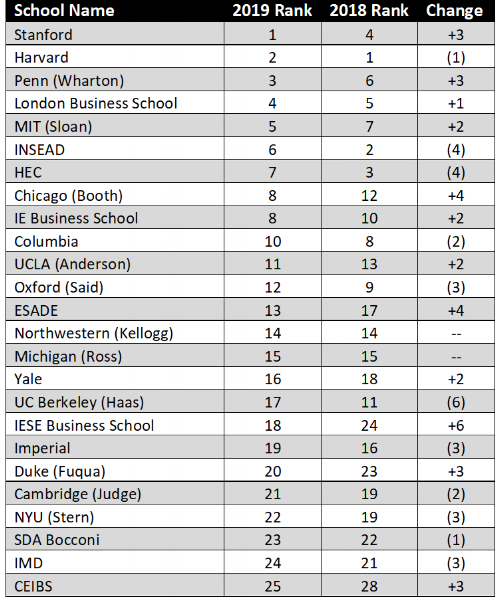 McKinsey, the second largest employer of MBAs, is the top employer of MBA graduates at Northwestern Kellogg, Chicago Booth, and Columbia Business School. Following McKinsey in MBA recruiting are Bain and Company, The Boston Consulting Group, and Deloitte. At Stanford, the percentage of graduates securing roles in consulting is lower but trending upwards. The Salary Trends Report projects another year of modest growth for the industry in 2018 (4 percent) with a slight decline predicted for 2019 (-1 percent). For prospective business school students, we’ve created a short list of resources, including Apply Point blogs and information from external organizations, that will help guide you through the application process. o MBA School Selection: What are the Alumni Saying? o Want a Career Abroad? Consider a European MBA. o MBA Application Submission: Is There an Optimal Deadline? o The GMAT V. The GRE: Which Test is Best for You? · The MBA Tour is an independent and high-quality information source regarding MBA admissions. Events emphasize personal interaction between prospective MBA students, business school admissions representatives, alumni, and other like-minded education enthusiasts. · The Consortium for Graduate Study in Management is a continually growing and evolving alliance of some of the world’s leading graduate business schools and business organizations, supported by the strength of an extended network of students and alumni. · The National Black MBA Association is the premier business organization serving black professionals. · Prospanica, formerly the National Society of Hispanic MBAs (NSHMBA), emphasizes educational and professional development programs to improve the Hispanic community as a whole. · The Forte Foundation is a non-profit consortium of leading companies and top business schools working together to launch women into fulfilling, significant careers through access to business education, opportunities, and a community of successful women.